Hi friends! In just 30 minutes Helen and I are gonna hop on a plane to LA, and then we’re off to sunny Mexico on a cruise with my 90-year-old granny and big brother Cameron! I’m excited. I’m going to eat lots of food. It’ll be so weird to be away from the computer/internet/cell phone for a week but, aside from missing Andy, it’ll be fun too! A couple days ago I made these chicken wings for this week’s food52 contest (of course). The contest this week was über fun (umlaut!). You were supposed to submit a dish featuring blood orange, feta, and mint. Helen and I both eschewed the traditional blood orange salad and instead opted for very silly creations! Helen made a feta frozen yogurt! And I made chicken wings! I think they turned out ‘right nice too. They have a blood orange reduction as a glaze, that’s sweet and tart and a little bit spicy from an addition of chile flakes. 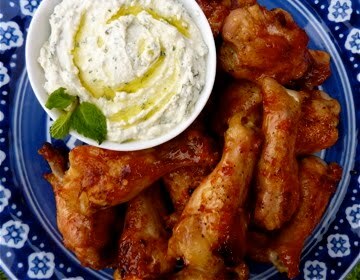 Then I served them with a whipped feta with mint as a dip. That dip was good too! If you make it, make sure you rinse your feta before you crumble it- otherwise it will be too salty. The dip also firms up if you refrigerate it, but it’s a great spread for crackers at that point! So happy spring break friends! I’ll miss you! Previous Article Cookbook Time for Me! yum. that looks tasty. hope you had a good/safe trip with Gma. She has been talking about it for months.